The Vol. 10x, No. 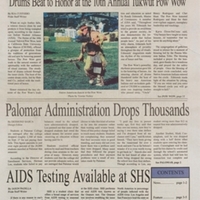 6 edition of The Pride reports on the 10th Annual Tukwut Pow Wow, AIDS testing at the Student Health Services as well as administrative drops of Palomar College students for payment issues. 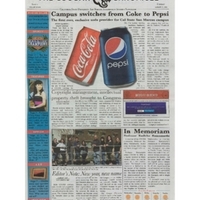 Volume 39, Number 1 of the first edition of the Cougar Chronicle. Some of the stories include campus sale of Pepsi over Coke, intellectual property, the passing of a professor, and new transportation options.